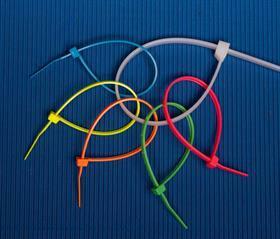 KWW Paper carries an extensive line of conventional cable ties, tie wraps and zip ties in a variety of colors and strengths. With Kilmer, Wagner & Wise you can be confident you are receiving the highest quality available. We use only the best manufacturers and test product specifications in our own quality department to ensure your product will meet or exceed expectations. Miniature Cable Ties - 18 lb. Intermediate Cable Ties - 40 lb. Standard Cable Ties - 50 lb. Heavy Duty Cable Ties - 120 lb. Extra Heavy Duty Cable Ties - 175 lb. Ultra Heavy Duty Cable Ties - 250 lb. Depending on your specific application, we can provide zip ties for indoor or outdoor use, ties that can withstand sunlight or heat exposure, or cable ties that are resistant to certain chemicals. Regardless of your specific requirements, Cable Tie Express can provide both the product and expertise you need.